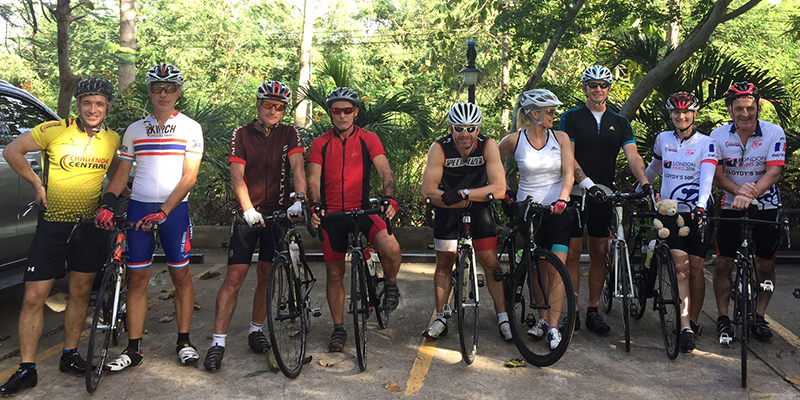 The day we have been waiting for arrived today with our group’s first chance to experience cycling in Thailand. After a carb-loading breakfast, we met with the entire support team at the hotel reception at 9am to load the minibus with all our kit. As Bangkok is such a busy city, cycling out of the capital would simply be a nightmare! The cycling therefore starts a couple hours away in a city called Hua Hin. The minibus journey was broken up with a short stop at a historic cave in Petchaburi where monkeys are running around freely! After arriving at the Vana Varin Resort in Hun Hin, we were served lunch and checked into our beautiful Thai style huts situated around a lake. At this point I was disappointed to learn that my bike was damaged in transit and unable to change gears. Fortunately, nothing is too much trouble in Thailand and a visit to a local bike mechanic got it sorted on the spot. At 15:30 the cycling began and I was quickly reminded why Thailand is such an awesome place for cycling with the smooth, rolling and quiet roads with stunning views. With the shortest day and the only circular route complete, we had quick visit to the bar before getting changed and heading out into the centre town to sample a vibrant night of markets and famous sea food restaurants.